Welcome back. Having learned about the wealth of information that may be conveyed by the lengths of your fingers--see last Friday’s post, Finger Length Ratio--you are now, of course, wondering about your toes. Do they too provide indications of behavioral, health, sexuality or other significant information? My search to address this question suggested two bins, research and, for the moment, myths. The latter bin is much fuller, so I’ll empty that first. Some believe foot shape identifies heritage (e.g., Egyptian, Roman, Greek, Germanic or Celtic); the premise being that our genome determines certain physical factors and our morphology is heritage dependent. Among the problems with defining such lineages is the complexity that arises with centuries of mixing. The Common Foot (aka Roman Foot) belongs to someone balanced and well proportioned, who is typically outgoing and sociable and open to new experiences and cultures. The Flame or Fire Foot (aka Greek Foot) belongs to the active and creative types, who are enthusiastic about new ideas and people, though they can be impulsive and thus stressed. The Square Foot (aka Peasant Foot) belongs to dependable, practical people, who examine every decision in detail. The Stretched Foot (no reported aliases, though it looks like a squeezed Egyptian to me) belongs to private individuals with hidden depths, who may be impulsive and change mood often. Personalities are also linked to foot size, toe positioning, heels and more, which brings me to foot reading. Big Toe - If it’s much longer than other toes, you are clever and creative, though you may have problems focusing and seeing projects through; if it’s shorter, you’re a superb multitasker, who delegates effectively and persuades with charm. Second Toe – The longer the toe next to the big toe, the more leadership qualities you have, though this can become bossiness; if shorter, you value harmony and are satisfied biding your time. Three studies rose to the top, and one of those was more about fingers than toes. A 2002 publication from the University of Texas used digital scans of hands and feet to estimate all possible finger and toe length ratios, excluding those with thumbs, from 122 heterosexuals (62 female, 60 male) and 64 gay persons (29 female, 35 male). The findings regarding finger length ratios were in agreement with those reported in last Friday’s blog post. New and of some interest is that nearly all finger ratios for gays fell between those of heterosexual males and females, though few of the differences were significant. Toe length ratios were larger than finger length ratios, and gender differences were smaller; however, because of substantial toe arching, the toe lengths estimated from the digital scans were less reliable and conclusions less certain. The University of Texas study findings, other than those for gays, were replicated with more success in 2010 by University of Vienna researchers with 69 females and 59 males. Also in 2010, a study from Pennsylvania State University focused on the second toe. As noted in last Friday’s post, the generally accepted cause of different finger length ratios and possibly of behavioral and other differences is prenatal androgen (e.g., testosterone) exposure. Pursuing evidence of a link between the second toe length and prenatal androgenization, the researcher collected self-reported information from 107 students (70 female, 37 male) on their second toe length and on behaviors and traits previously shown to be related to testosterone and finger length ratios. Females with longer second toes reported more competitive orientations and physical aggression, while men reported greater exercise frequency. Results for both males and females showed a significant association between longer second toe length and left-handedness but no association with sociosexual or sexual orientation. Foot reading and assigning personalities to foot shapes and toes seems akin to what you discover about yourself after opening a fortune cookie. But, hold on. Research on toes may lend credence to some of the observations. 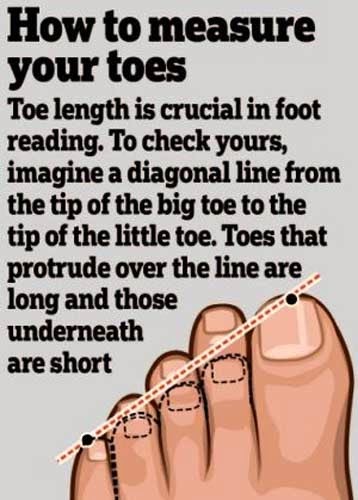 If finger length ratios is worthy of research, why not more work on toe length? In any event, thanks for stopping by.